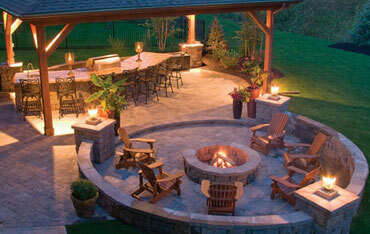 A great patio design for entertaining large groups, with separate areas for entertainment. 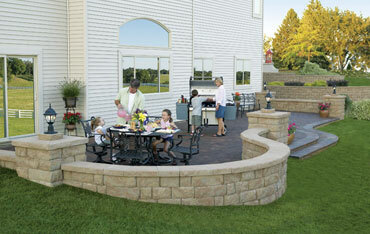 The Anchor Highland Free Standing Wall provides extra seating when needed around the Aspen firepit. This design will accommodate a large patio table with chairs for seating up to 8, a grill area and additional seating. This patio design is more functional and intimate patio design then a deck. 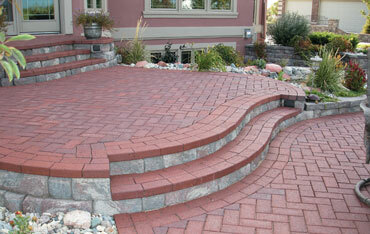 The raised patio provides the beauty of Hardscape product with necessary elevated design. You can easily expand this idea with a combination lower patio as well. This design will accommodate a table and chairs with comfortable seating up to 6 and optional grill additional seating areas as well. This quant patio project is the perfect escape form the ordinary patio. The Bella Pavers provide a beautiful and inviting area, while the Anchor Highland Freestanding Wall provides a natural boundary with optional extra seating when needed. This design is ideal for a patio table and chairs up to 6, plus an additional seating area and grill. This design allows you to maximize your outdoor entertainment space. The structural Anchor retaining wall expands your patio’s foot print, while the Bella Pavers create a warm and inviting place to relax with family and friends. This is the perfect design for walkout patio’s or against a grade change. 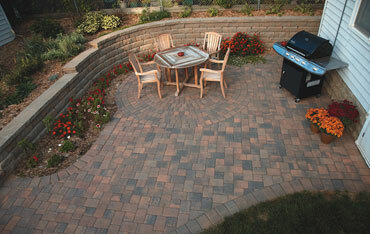 This patio design comfortably seats 6-8, with additional seating a Anchor Freestanding wall and grill area.